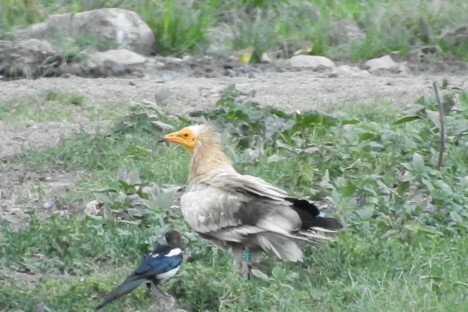 The Egyptian vulture suffers a high mortality rate and not many young birds happen to reach maturity. Back in time we were ringing all juveniles hatched in Bulgaria with one and the only hope – to observe it again in the sky over their breeding grounds. That‘s how 78 of the offsprings between 2007 and 2010 got a PVC and a metal ring on their legs. Years were passing by and only 13 of them were obsered again on various places, mostly feeding stations in the Balkans. Two of them even happen to recruit in breeing territories and to mate with partners. However since 2015 we didn‘t get any new observations…till now. On the 10th of August a bird that was missing for 6 years appeared on the map. B14 was observed close to Varna by Mr. Zdenek Hil who kindly set the information and photos of the bird. The story of the bird begins in the late spring of 2008 when it was hatched in a nest in northeastern Bulgaria. The bird had a sibling and on the 24th of July, 2008 both chicks were ringed. Then the bird disapeared in the migration flow and a silence settled. On the 25th of May, 3 years later, B14 emerged again. It was observed by Mr. Nimrod Ben-Avraham in the Negev desert, feeding with another Egyptians and Griffon vultures on a feeding station, most probably making its‘ way north to the Balkans. Hopefully 6 years later the bird is still alive and in its‘ natal area where started the big game called life 10 years ago.